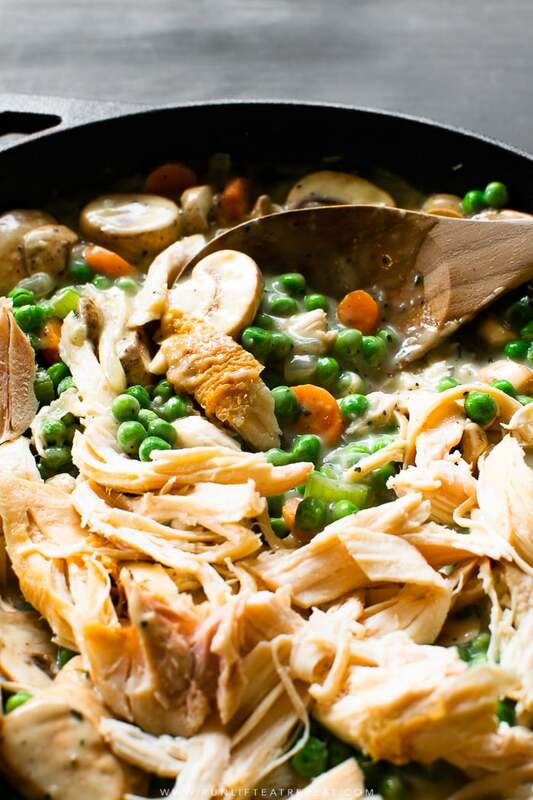 This easy recipe is a family favorite for using up leftover chicken for Thanksgiving turkey! It’s not quite the pie that fills up the dessert table, but a it’s a darn good pie nonetheless. Here’s the reality of the day after Thanksgiving. You hit up the Black Friday sales. You’re now home, exhausted, and ravenous. You open the refrigerator and see containers filled with leftover turkey— “what do I do with all this leftover turkey? !” Maybe I can help. Today we’re making this in a skillet. Do you have an oven-proof skillet yet? If not, get one! You can make turkey meatballs and chicken parmesan and sloppy joes and macaroni and cheese. 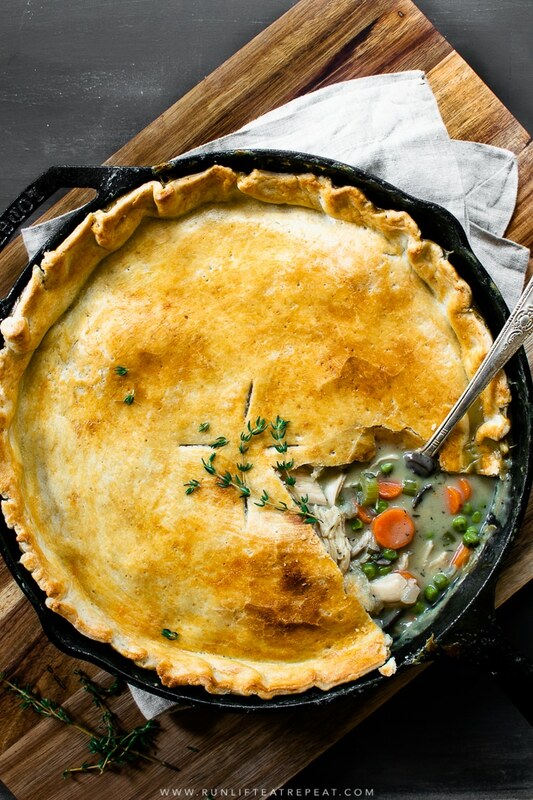 And now let’s add this suuuuuper easy skillet pot pie to the list. 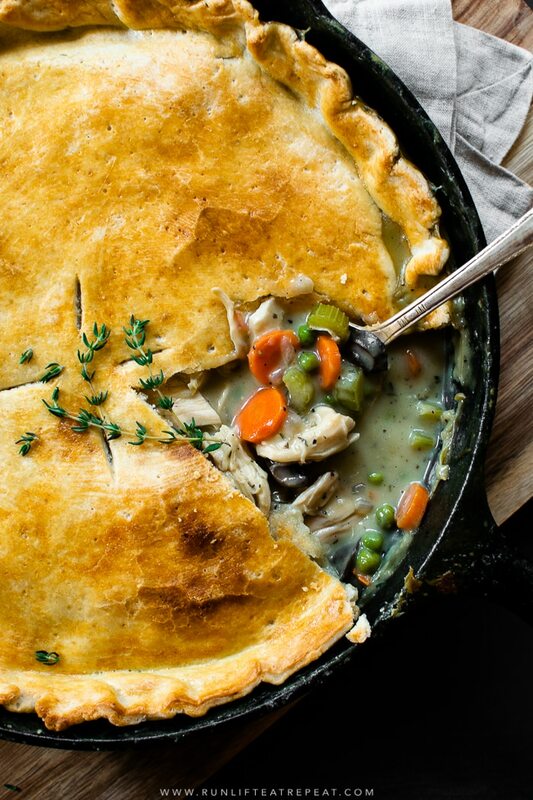 It all started from a leftover rotisserie chicken, some leftover veggies + chicken stock from this soup, and a lonely pie crust sitting on the shelf. It felt like 30°F outside and something comforting came to mind. 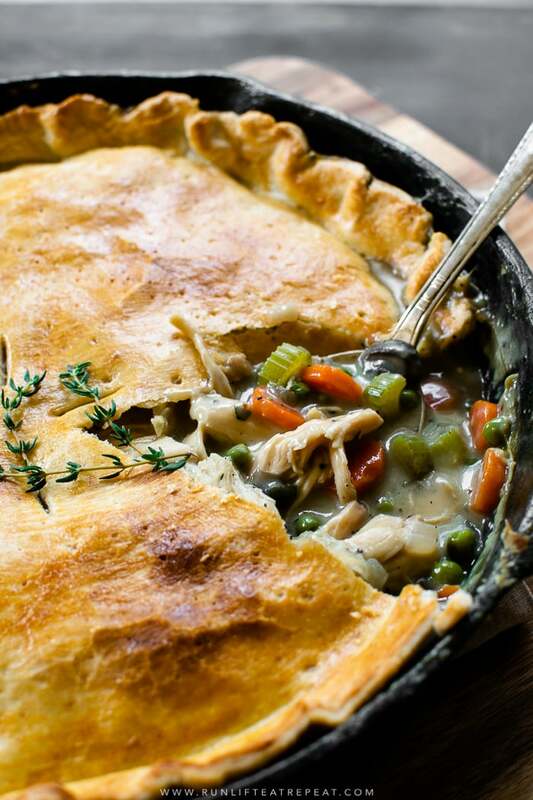 Here’s a time-saver tip: stock your fridge or freezer with pie crust NOW. Rather than making loads of pie crust the day before holiday, make it ahead of time— wrap it in plastic wrap, and put them away. It’ll take about 20 minutes of your time but you’ll be thanking yourself later, even post-holidays. Make the pie crust: In the bowl of a food processor, add the flour, salt, and coconut oil. Process together for 1 minute or until no visible chunks remain. This can also be done by hand with a pastry cutter, but takes a bit longer. Starting with 4 Tablespoons of water, add in the ice water and process to combine. Add in 1-2 additional Tablespoons at a time until the dough sticks together when bunched in your hand. For me, it typically takes 8-9 Tablespoons of water. Transfer the dough to a lightly floured work surface. The dough should come together easily and should not feel overly sticky. Using floured hands, fold the dough into itself until the dough forms. Form it into a ball and flatten into a 1-inch thick disc using your hands. Wrap tightly in plastic wrap. Refrigerate for at least 20 minutes (and up to 5 days). 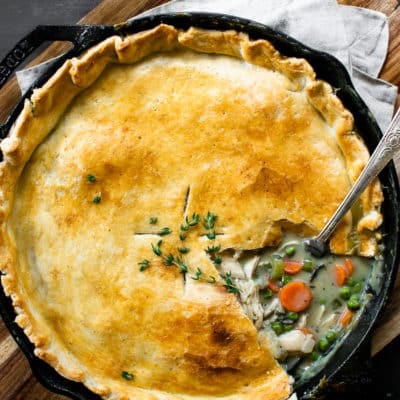 Make the pot pie: Heat the butter in a 12 inch oven-safe skillet over medium-high heat. Add the onion, carrots, celery, and garlic. Sauté for 5 minutes to allow the vegetables to sweat a bit and become soft. Stir in the salt, pepper, thyme, sage, and flour. Cook for an additional 3-4 minutes. Add the chicken broth and milk. Brig to a boil, reduce the heat to medium-low and allow to simmer for 5-6 minutes. The sauce will thicken as it cooks. Stir in the vegetables and chicken/turkey. Cook for 1-2 minutes. Remove from the heat and allow to slightly cool for 10 minutes. Roll out the chilled pie dough: On a lightly floured work surface, roll out the pie dough. Turn the dough about a quarter turn every few rolls until you have a circle about 1 inch larger than your pan — for this, about 13 inches. Carefully lay the dough over the filling. Crimp the edges to seal and cut a few slits in the top for steam vents. Lightly brush the top of the pie crust with the egg wash.
Bake for 35-40 minutes or until the top of the crust is slightly golden brown. For added color, you can broil for 1-2 minutes — keep a close eye so it doesn't burn. Remove from the oven and allow to cool for 5 minutes before serving. 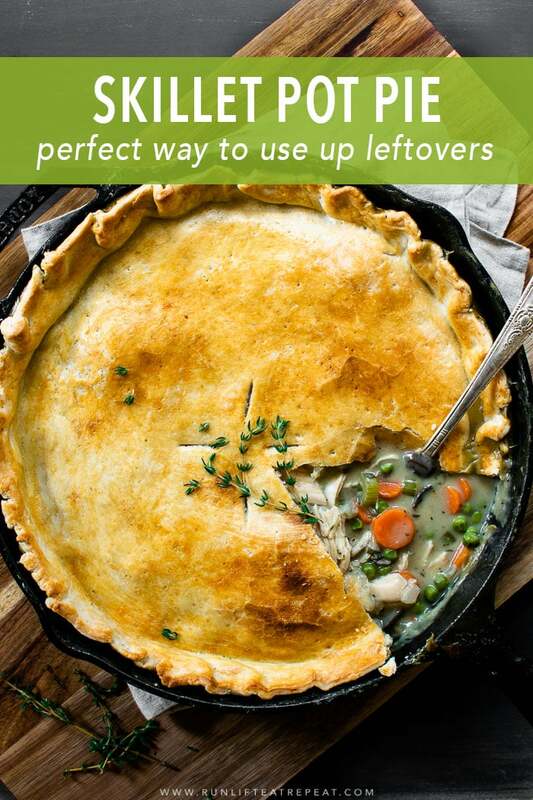 Leftovers keep well in the refrigerator in a container for up to 5 days. Reheat as you like. Make ahead tip: The filling can be prepared up to 1 day in advance. Cover tightly and store in the refrigerator. When ready, continue at step 5. 1. To make this dairy-free, use ghee in place of butter and unsweetened almond milk. 2. 1-2 cups of any vegetables work for this. I typically use a mix of frozen peas and sliced mushrooms. But use your favorite! 3. 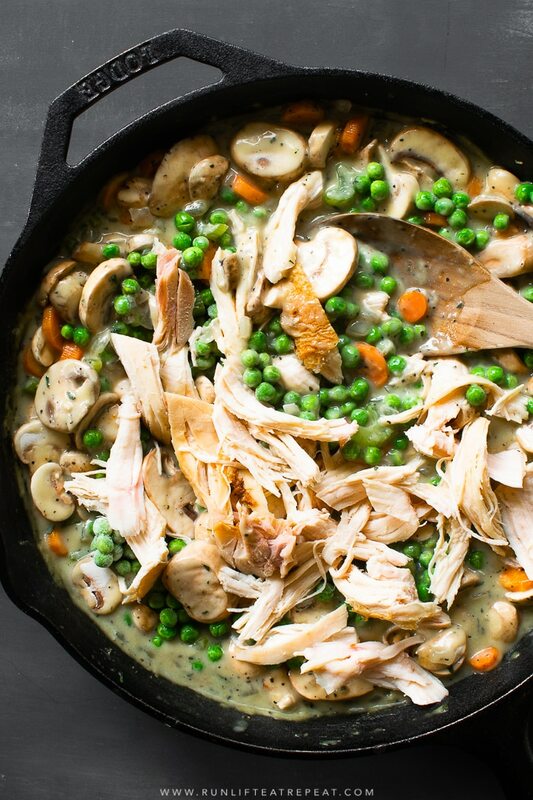 When I make this I grab a store-bought rotisserie chicken since it's easiest. After Thanksgiving, I set aside leftover turkey and use that instead. Try my lightened-up chicken noodle soup for leftover turkey too! Previous Post: « 15 Holiday Gifts for the Baker (or Cook!) In Your Life. This looks delicious and sounds so much better than endless leftover turkey sandwiches. Ditto on that! I love a good turkey sandwich, but this is my go-to recipe for after Thanksgiving!